In the northern part of the region of Gorski kotar, north of the mountain area of Risnjak and the city of Delnice, there is a mountainous and forested area with the settlements of Gerovo, Čabar and Prezid as key centers. This area offers a sight of the most beautiful mountain oasis in that part of Croatia. The area is surrounded by the Slovenian territory on two sides. To the east, it is bordered by a small river called Čabranka; to the west, its border passes through immense forest expanses; at its northernmost point, in Prezid, there is a border crossing point where Via Dinarica enters Croatia from Slovenia. After the cessation of the Schengen border procedure at the border between Croatia and Slovenia and following some other preconditions, the idea is to move the White Line route of Via Dinarica to the route of what was once the Snežnik – Snježnik path. 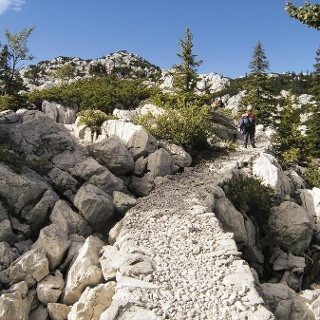 Along the edge of the area of Čabar and Prezid, the main part of the route is the Gorski Kotar Hiking Trail, marked by standard hiking trail markings. The key starting point for excursions is Tršće, with a mountain hut in the hamlet of Frbežari. Interesting climbs are possible from there to the peaks of Rudnik and Sokolska stijena. Despite being isolated in terms of transport connections, this area is well developed thanks to the wood industry in Čabar and the vicinity of Slovenia. One thing that visitors are bound to notice is that the settlements are in very good order, with plenty of pleasant houses with flowers in the windows. In addition to the wood industry, the entire area is also focused on hunting tourism. From the border crossing point Babino Polje / Prezid, the road leads to the center of Prezid. At the entrance to Prezid, one can see hiking trail markings on the main road – those to the right take hikers towards Milanov vrh (hunting lodge), and those to the left lead towards the peak called Vražji vrtec (a nice viewpoint). From Vražji vrtec onwards, it is best to follow the well-marked route of Gorski Kotar Hiking Trail (Goranski planinarski put, GPP) along the northern and eastern edge of the valley of Prezid. The trail leads across the area of Kozji vrh covered in grass (with a transmitter station), and descends to the road at an inn in the village of Kozji Vrh. Hiking trail markings along the road lead through the village of Gorači towards Tatinska draga (there is a monument on the left side of the road), and the route then steeply descends through the forest in many bends to the source of the Čabranka River. This river represents the border between Slovenia and Croatia. 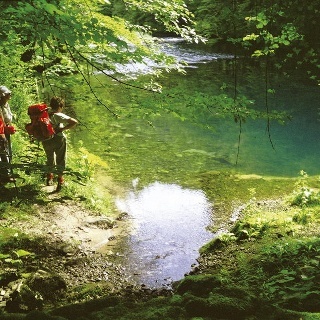 From the source of the Čabranka River, a walk along the right bank of the river will bring us to the center of the city of Čabar in 2 kilometers. From the cemetery at the church in the center of Čabar, hiking trail markings of Gorski Kotar Hiking Trail lead uphill towards the village of Kraljev Vrh (the second highest village in Croatia). From there, it is easy to descend to the settlement of Tršće by road. The trail after Gorači towards Cabar still needs maintainance; trees are blown over and block the trail (Apparrently nothing has moved since 2016). A link to somewhere to buy maps of these areas would be most welcome. Planning on hiking the trail next year. Thanks in advance.